Beet juice reduces need for rock salt as de-icer in Canada. But it may not work for Maine. Rock salt from a front-end loader lies on the pavement at the Bangor Public Works facility off Maine Avenue, Dec. 8, 2009. When winter ice starts to slick sidewalks and roads, most Mainers are familiar with the crunch of rock salt under their shoes and tires. In some North American cities, that sound is being muffled by the gooiness of beet juice. Rock salt, or sodium chloride, has become the go-to ice remover for cold, wintery areas. Though there are other chlorides available for de-icing, like calcium chloride and magnesium chloride, some chilly cities have added beet juice, an unexpected ingredient, into their de-icing regime. As Canadian cities embrace the amaranthine de-icer, could Maine follow their lead? Though rock salt is inexpensive and effective, it comes with a cost. Salt corrosion damages cars, roads and bridges. There is also an environmental cost. For one, moose are more attracted to the roads — which essentially become an enormous salt-lick — increasing traffic danger to motorists. As rock salt dissolves, it not only helps remove ice from the roads, but it also seeps into the ecosystem, damaging roadside plants and aquatic environments. Adding beet juice to the pre-wetting salt brine helps mitigate some of these impacts. Rock salt clings to the sticky substance, which reduces the excess runoff. Beet juice also helps the de-icing process in low temperatures because it further depresses the freezing point of water. Canadian cities have embraced beet juice in their de-icing regime in an effort to cut down on the need for salt. Cities like Toronto and Calgary, as well as some smaller towns in Quebec, have mixed beet juice into their salt brine. Winnipeg in the Canadian province of Manitoba is using beet juice across the entire city after piloting the program in small areas of the city starting in 2015. Michael Cantor, manager of Streets Maintenance at Winnipeg Public Works, explained that beet juice is mixed with the brine that is used to prewet the roads before the rock salt is applied, which allows less salt to be used overall. “We saw good results, especially when you use it together with salts or with sand in very cold temperatures,” Cantor said. “Especially below minus 10 [degrees], salt and brine by itself doesn’t work very well. [Beet juice] sticks very well to the pavement in cold temperatures.” This is especially beneficial, he said, when de-icing bridges, which cool faster than roadways. Cantor said the dark liquid is not as aesthetically unsettling as it may seem; it is barely visible on the dark pavement, and the water soluble liquid is easy to remove from car wheels. Though the program has only been in place for a few years, he predicts that it will have a positive impact on the environment and infrastructure over time. Could the same be done in Maine? Brian Burne, highway maintenance engineer with the Maine Department of Transportation, said that places like Manitoba have one primary advantage over Maine: location. Beet juice is produced mostly in the Midwest, so between the cost of shipping and additives to preserve the liquid through the journey, the mixture is prohibitively expensive. Burne said Maine has experimented with other, less costly mixtures added to salt brine to “stretch it even further,” like Magic-0, a magnesium chloride mixed with molasses. 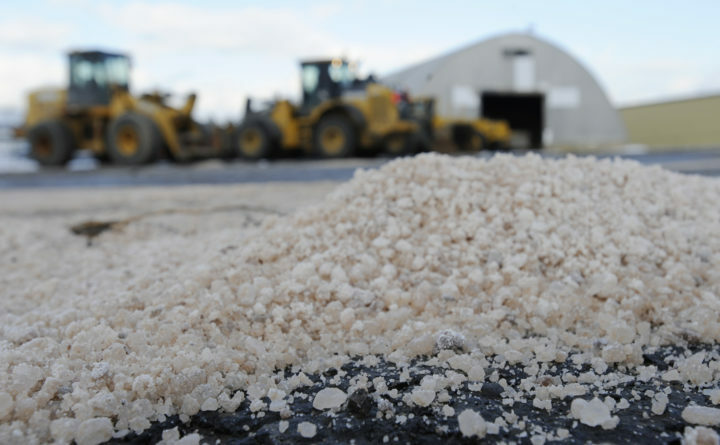 Still, Burne said 86 percent of what goes on the roads in Maine for de-icing is rock salt. Beet juice also may not be a catchall for preventing environmental damage. When beet juice makes its way into streams, its sugar could attract unwanted bacteria. A 2018 study from the American Physiological Society found that exposure to the high potassium levels in beet juice compromised the organ function of freshwater mayflies.